288 and 289. The former is what is termed a recoil, and the latter a repose or deadbeat escapement for clocks. The same letters of reference indicate like parts in both. The anchor, H, L, K, is caused, by the oscillation of the pendulum, to vibrate upon the axis, a. Between the two extremities, or pallets, H, K, is placed the escape-wheel, A, the teeth of which come alternately against the outer surface of the pallet, K, and inner surface of pallet, H. In 289 these surfaces are cut to a curve concentric to the axis, a; consequently, during the time one of the teeth is against the pallet the wheel remains perfectly at rest. Hence the name repose or dead-beat. 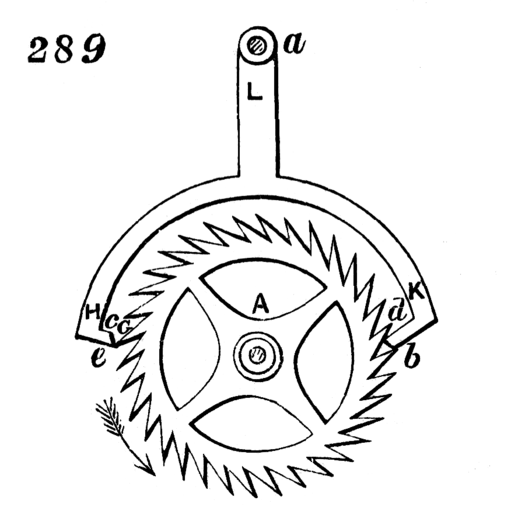 In 288 the surfaces are of a different form, not necessary to explain, as it can be understood that any form not concentric with the axis, a, must produce a slight recoil of the wheel during the escape of the tooth, and hence the term recoil escapement. On the pallets leaving teeth, at each oscillation of the pendulum, the extremities of teeth slide along the surfaces, c, e, and d, b, and give sufficient impulse to pendulum.